For other uses, see Ginza (disambiguation). Ginza (銀座) is a district of Chūō, Tokyo, located south of Yaesu and Kyōbashi, west of Tsukiji, east of Yūrakuchō and Uchisaiwaichō, and north of Shinbashi. It is a popular upscale shopping area of Tokyo, with numerous internationally renowned department stores, boutiques, restaurants and coffeehouses located in its vicinity. Ginza is recognized by many as one of the most luxurious shopping districts in the world, attracting visitors and regulars alike from across the globe. Designs for the area were provided by the Irish-born architect Thomas Waters; the Bureau of Construction of the Ministry of Finance was in charge of construction. In the following year, a Western-style shopping promenade on the street from the Shinbashi bridge to the Kyōbashi bridge in the southwestern part of Chūō with two- and three-story Georgian brick buildings was completed. These "bricktown" buildings were initially offered for sale and later were leased, but the high rent prevented many of them from being permanently occupied. Moreover, the construction was not adapted to the climate, and the bold design contrasted the traditional Japanese notion of home construction. Ironically, the new Ginza was not popular with visiting foreigners, who were looking for a more Edo-styled city. 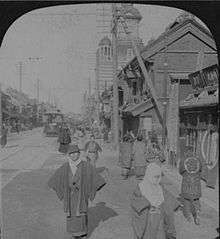 Isabella Bird visited in 1878 and in 1880 implied that Ginza was less like an Oriental city than like the outskirts of Chicago or Melbourne. Philip Terry, the English writer of tour guides, likened it to Broadway, not in a positive sense. Nevertheless, the area flourished as a symbol of "civilization and enlightenment" thanks to the presence of newspapers and magazine companies, which helped spread the latest trends of the day. The area was also known for its window displays, an example of modern marketing techniques. 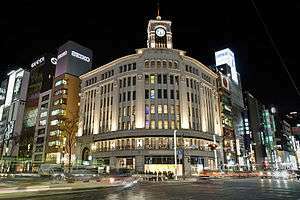 Everyone visited so the custom of "killing time in Ginza" developed strongly between the two world wars. Most of these European-style buildings disappeared, but some older buildings still remain, most famously the Wakō building with the now-iconic Hattori Clock Tower. The building and the clock tower were originally built by Kintarō Hattori, the founder of Seiko. Its recent history has seen it as a prominent outpost of western luxury shops. Ginza is a popular destination on weekends, when the main north-south artery is closed to traffic since the 1960s, under governor Ryokichi Minobe. Many leading fashion houses' flagship stores are located here, in the area with the highest concentration of western shops in Tokyo. It is one of two locations in Tokyo considered by Chevalier and Mazzalovo to be the best locations for a luxury goods store. Prominent are Chanel, Carolina Herrera, Dior, Gucci, and Louis Vuitton. Flagship electronic retail stores like the Sony showroom and the Apple Store are also here. Ricoh is headquartered in the Ricoh Building in Ginza. The neighborhood is a major shopping district. 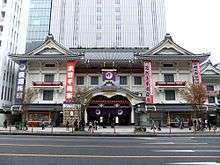 It is home to Wako department store, which is located in a building dating from 1894. The building has a clock tower. There are many department stores in the area, including Hankyu, Seibu, and Matsuya. There are also art galleries. Each Saturday and Sunday, from 12:00 noon until 5:00 pm, the main street through Ginza is closed off to road traffic, allowing people to walk freely. This is called Hokōsha Tengoku (歩行者天国) or Hokoten for short, literally meaning "pedestrian heaven". 1 2 3 4 Dk eyewitness travel guide japan. [S.l. ]: Dk Publishing. pp. 66–67. ISBN 9780756694739. 1 2 Tokyo from Edo to Showa. Tuttle Publishing. p. 75. ISBN 9784805310243. ↑ Chevalier, Michel; Mazzalovo, Gerald (2012). Luxury Brand Management. Singapore: John Wiley & Sons. p. 2. ISBN 978-1-118-17176-9. The other prime location is Omotesandō. ↑ "Company Data." Ricoh. Retrieved on January 13, 2009. Wikimedia Commons has media related to Ginza. Wikivoyage has a travel guide for Ginza.